Needed a digital solution to host a variety of forms used by their largely mobile workforce, that would simplify their client facing processes, while remaining familiar and easy to use. Used GoFormz Mobile forms to digitize their forms, allowing the Bartlett Homes team to quickly capture signatures and approvals, without running back and forth from the office (no more faxing, scanning or manually entering data). Eliminated the need to deliver, collect and accumulate overwhelming amounts of paper forms ­– saving time, and reducing costly obstacles to productivity. Provided management with clear, scheduled reporting on collected data – delivering real time insights into sales metrics and project progress. Bartlett Homes & Roofing has designed and built custom homes in the Treasure Valley of Idaho for 25 years. The talented Bartlett Homes team focuses on providing custom, high quality services “from roof to floor” –– maintaining the design and build of homes, as well as various roofing crews throughout the area. Providing expert, specialized care for various housing projects simultaneously requires the Bartlett Homes team to strike a balance between efficiency and attention to detail, a difficult task. As multitasking specialists from “Roof to Floor,” Bartlett Homes needed a digital solution that owned and streamlined their process from start to finish –– enter, GoFormz. Throughout his research, Jeramie came across several mobile form platforms that didn’t fit the bill. Bartlett Homes needed an easy to launch platform that would streamline client documentation and form creation, that the entire staff (even the less tech-savvy) would be able to easily use. Upon finding GoFormz, Jeramie used his free trial account to digitize their most popular form, the Roofing Agreement, and was very happy with the simplicity and versatility of the user interface and form completion process. After completing his trial and implementing GoFormz, Jeramie expanded the Roofing Agreement to encompass more detail within one form, effectively reducing the need for additional client facing paperwork or repeat visits. Now Bartlett Homes is bolstering their GoFormz collection to include mobile safety assurance forms –– allowing Bartlett homes representatives to visit job sites and capture vital safety and quality assurance details and images (e.g. ensuring employees are wearing harnesses, and including pictures of project details). Before implementing GoFormz, a large amount of time was spent transporting documents. “There’s a lot of time spent driving back and forth to deliver documents, to pick up documents, to copy documents.” With GoFormz mobile forms and documents, Bartlett Homes customers and team members are immediately emailed a copy of completed forms upon submission, eliminating the need to travel back to the office to scan, copy or fax documents. Saving significant time, and money. Jeramie also frequently utilizes GoFormz reports for weekly or daily scheduled reports, allowing for insightful, real-time coverage and tracking of sales metrics and project progress. The best part? Reports are automatically emailed to Jeramie –– no reminders or extra time necessary. 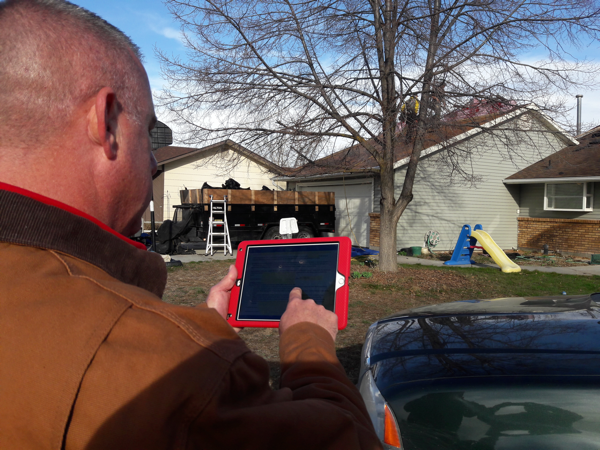 Since adopting GoFormz, Bartlett Homes & Roofing has saved a large amount of time and money, Jeramie estimates about ten hours a week per user. “I can take those extra ten hours I saved with GoFormz and make another two or three sales throughout the week.” Considering the time it previously took to copy paperwork and run documents to the office and back to customers, having a mobile solution that instantaneously delivers and automates the process was a great help. With dramatic time savings and client facing improvements, Bartlett Homes & Roofing is well on their way to becoming an example of modern efficiency. Excited with their progress and initial success, Bartlett Homes is working to expand their GoFormz collection, and further enrich their forms with powerful features and logic.